The home’s architecture is unconventional for the neighbourhood. Sylvie Belanger and Richard Simpson were bereft when their home at 38 Hugo Ave. was one in a row of Edwardian townhomes ravaged by fire in 2008. Not only did the blaze destroy their house and beloved art collection, it ushered in a long period of trauma, upheaval and wrangling with authorities. After a few years the couple has a new perspective: The calamity created the opportunity to build the new house that arose from a collaboration between Ms. Belanger and architect Kevin Weiss. Ms. Belanger is an artist who often spends long stretches working from a studio in such cities as Amsterdam and San Francisco. With the rebuilding, she was able to design her own studio in the home's former garage. The space also became their pied-à-terre after the insurance benefits and emergency cash dwindled. A living space at 38 Hugo Ave.
Weiss Architecture and Urbanism Ltd. is located in the same Wallace-Emerson neighbourhood near Dupont Street and Dundas Street West. Ms. Belanger knew she wanted to work with Mr. Weiss when he immediately grasped her desire for light and movement – and no flat roof. "I told him, you have to create movement. I want light," she says. "He got excited about that. The movement and angularity of the house was something he appreciated. He got it from the first sketch." Ms. Belanger's edict against a flat roof partly came from the home's position on a corner. "On the corner in Toronto, if you see a flat building, it looks like a fortress." Instead, rooms are organized around a triangular courtyard. Roofs are tilted at various angles. The studio’s exterior is made from corrugated aluminum. For the exterior of the studio, Ms. Belanger chose corrugated aluminum, which she has used in her work as an artist. The material looks good and requires no maintenance, she says. Mr. Simpson also found the industrial appearance appealing. The reactions of some neighbours, however, ranged from curious to hostile. During construction, people would pass by on the street and make caustic remarks about the unorthodox architecture. The zeitgeist of the neighbourhood has changed in recent years with the arrival of many young professionals and creative types, Ms. Belanger says. Now they all stop to admire the house. The living room overlooks Carlton Park. The two-storey house, which was completed in 2010, has three bedrooms, three bathrooms in 1,755 square feet. The main door opens to a front foyer with a 24-foot light-well above the central staircase. The open plan of the main floor includes a living room overlooking Carlton Park, a dining area and a kitchen. The kitchen was crafted of Baltic Birch for Mr. Simpson, who is the chef in the household. The kitchen cabinets are made from warm birch. Ms. Belanger chose the same palette of warm birch cabinets and simple grey and white tones for the bathrooms. "When you work with beautiful materials, you let them speak," says the artist. A small home office on the main floor is the only box in the house, Ms. Belanger points out. Sloped ceilings make each of the three bedrooms unique. Upstairs, three bedrooms have sloping ceilings and angled walls so that each room is unique. One of the elements that the couple enjoys most today is the way that shadows – created by the light pouring through from outside – appear on the walls. The swaying tree branches and quivering leaves create the light and movement that Ms. Belanger envisioned from the start. "The light stays magnificent all of the time," says Mr. Simpson. The small, triangular courtyard on the second floor provides a secret escape with a view of the stars on summer evenings. Mr. Weiss designed one angled wall to point directly at the CN Tower, which is visible in the distance, Ms. Belanger explains. The courtyard is breaching the interior and exterior, public and private space, she adds. It also creates sight-lines through the upper floor. From the master bedroom, for example, there's a view straight through the courtyard to a narrow window that frames a pine tree standing outside. 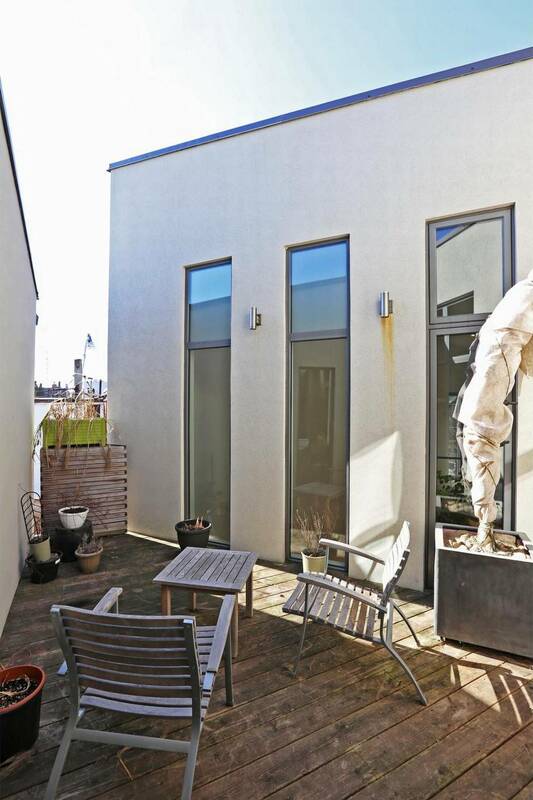 "To have a private courtyard on the second floor is incredible," says Mr. Simpson.